Summary: There's nothing in the world Army Sergeant Vic Carponti loves more than his wife and his country. Smart-mouthed and easy tempered, he takes everything as a joke . 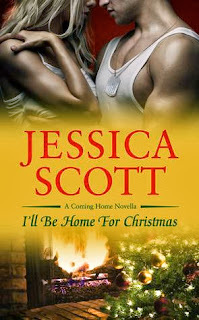 . . except his promise to come home to his wife, Nicole, for Christmas. As he prepares to leave for his latest deployment into Iraq, Vic will do everything he can to shield his beautiful, supportive wife from the realities of war . . . and from his own darkest fears. As a career army wife, Nicole Carponti knows just what to expect from her husband's tour of duty: loneliness, relentless worry, and a seemingly endless countdown until the moment Vic walks through the door again. But when the unthinkable happens, Nicole and Vic's bond is tested like never before and changes everything they believe to be true about the power of love and the simple beauty of being home for the holidays. Review: When I was finishing highschool, one of my best friends was dating someone in the military. Although I live in Canada and that means that most Canadian officers are serving as peacekeepers, I still found it hard to contemplate being in that sort of relationship. Loving someone who goes overseas to fight... Hard to cope with! This book explores exactly that idea, with Vic Carponti being sent overseas on deployment. He's been deployed before, but that doesn't mean that this time is any easier, especially considering that the fighting is even deadlier than before. The story examines the tension that develops when someone you love is overseas and under tension - as the POV goes from Nicole to her husband and back again, we see their innermost thoughts and fears, and the way each reacts to the other as their emotions are stretched to the breaking point. Vic immerses himself in humour to try and get through the roughest of situations, something that comes up frequently throughout the book. Meanwhile, Nicole does her best to stand up to the pressure of missing her husband and yet wanting to be a support system for him. Ultimately, the two of them are put under even more strain as the story takes a sudden turn, and there's no doubt that any reader will find themselves pulling for the couple, especially considering the subject matter and the season. My main caveat about the book is the writing. Although the story is compelling, it could have used a lot of smoothing and editing - it comes across very disjointed at times, almost stilted. A lot of short sentences are used, making it hard to fall as deeply into the story as would have been possible, and the plot climax was also not as fleshed out as it could be. The latter could be attributed to the fact that this is a novella, but the writing could really have been looked at. Overall, however, a sweet little story that is a nice, light read for the season. Disclosure: I received an ARC of this book through Netgalley in return for an honest review.